The decision to outsource part or all of your payroll is one not to be taken lightly. Even the slightest oversight can create untold work for you or your staff. A minor mistake could also leave you in a less-than-desirable position with the IRS and other agencies. 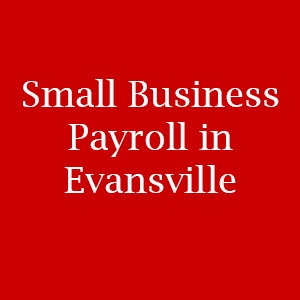 Having helped hundreds of small business owners in the Evansville area streamline their payroll needs, we find that the following services are important ones to consider when evaluating a payroll provider. From tracking employee hours to paying employment taxes, payroll processing can become quite a time consuming process. Does your potential payroll provider calculate wages, withholding taxes, and deductions? Will they print and deliver or direct deposit paychecks? Finding a payroll provider you can trust allows you to focus your work hours on growing your business, rather than repetitive tasks. Your payroll provider should manage federal, state, and local tax deposits. Businesses typically deposit the federal income tax withheld from employee wages in addition to employee social security and Medicare taxes once a month or semi-weekly. Failing to make your deposit on time could result in a hefty fee. State income taxes are determined based upon how your business is organized. There are different guidelines for sole proprietors, general partnerships, corporations, nonprofit corporations, limited liability companies, and other types of businesses. Be sure that your payroll provider understands your business and the state tax guidelines that apply to you. It’s also important to be sure that local county tax deposits are calculated correctly and paid in a timely fashion. Do you hire contractors to perform specific services for your business? Many businesses employ both regular employees and contractors, which can make tax preparation time a bit complex. Your payroll provider should be well-versed in preparing and filing Form W-2s as well as Form 1099s. Have you ever experienced a payroll discrepancy? A professional payroll provider can help you resolve payroll issues before they become a problem for your business. If you receive a payroll notice, you need to be able to rely on your payroll service provider to manage the notice on your behalf. The Baker team has extensive experience working with small business owners to simplify the often-complicated payroll process. From payment processing to tax compliance, Baker Retirement & Wealth Management, PC can support your every need. For three decades, the Baker team has been providing small business payroll and financial services to the Evansville community. Talk to a payroll expert today by calling us toll free at 1-866-244-3517 or click the button below.